You know this already, but I love to write and I love to organize. This morning, after watching three minutes of frugal shopping tips for 2013 on the Today show (the later, fake-news part) I decided I would pretend to be one of those organizing experts and write my own blog about my favorite organizing tips. I never would have had the guts (or the time) to write something so silly before but it's January 2 and thus a day when we're all still pretending to aim for our New Year's resolutions. If I wanted to stay in my cancer cocoon, I could definitely write a blog around the fact that my toes and finger tips are numb. (Brian did some trusty research yesterday and confirmed that neuropathy is a side effect of later chemo treatments.) But toe numbness likely has a limited entertainment value so I'd rather use my numb little fingertips to write about labels. Now that has some seriously exciting potential. I am certain that pretending to be an organizing expert is as useful as pretending to be a mermaid, but both end up providing me boundless entertainment so, as was said in the worst movie of all time (We Bought a Zoo), "Why not?" 1. Never underestimate the power of organization. One of the real mysteries of life to me has always been this -- do messy people feel as good as I do when things are clean and organized? Today I decided that I absolutely needed the answer to this question so I talked to Brianne after her school day wrapped up. In many ways (like mental ones), Brianne is far more organized than I am, but when it comes to stuff, she admits she can be a bit of a mess. Years ago I put her on Container Store probation when she mocked my mother and I up and down the aisles of my holy land. Recently she told me that she has a newfound appreciation for my favorite store (I think it's the beginning signs of nesting), and only because she's my best friend, I'll forgive her desecration. Anyways, after my informal research via Brianne on this very important of topics, I believe that even those without my organizational obsessions find great joy and satisfaction out of an organized space. 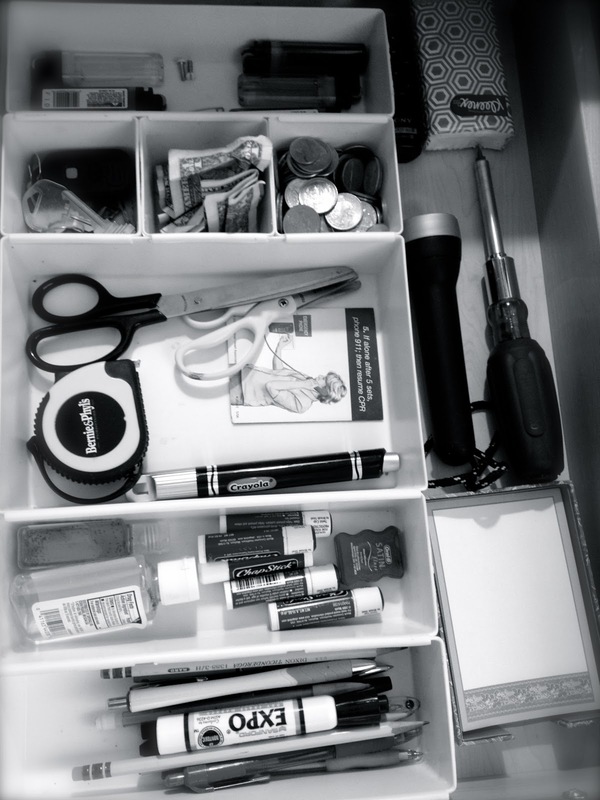 So, the foundation tip of all tips is to never underestimate the power of being organized. 2. Find the donation centers nearest to you, or a place for your yard sale/Craig's List pile. This is the absolute key to all levels of organization, as you will see in later tips. So before you do anything else, figure out the nearest drop off points for food (local food pantry? ), clothing, toys, furniture, etc. In my area, Big Brother Big Sister and other great charities also pick up this kind of stuff and calling to schedule a collection time could establish a great cleaning goal. If you'd prefer to make some money off of your junk -- I mean, your treasure -- find a big space in which to build your yard sale or Craig's List pile. My town even as a Facebook page for yard sale type stuff. I haven't quite figured out that page yet (for instance, what does it mean when someone writes, "bump" in a comment to a posting?) but a few weeks ago when I was helping my Mom clean her basement, I was able to use it to give away a huge TV for her in matter of minutes. However you do it, find a place where you can bring or temporarily store the stuff you no longer need because this will be one of the most important steps in the clean-up process. Did I mention I also love Chapstick? Instead, start big. Brian hates this part because when I start cleaning, things get a lot worse before they get better. For instance, remember that big file cabinet in our garage? The one that was uselessly taking up lots of valuable space? Start with stuff like that. If you have useless furniture, sell it. If you have old baby gear or kids toys that are hoarding space for no reason, get rid of them. Literally walk around the space and take out anything, especially big stuff, that is taking up room without any good purpose. I admit that this stage takes guts. Cold-blooded, non-sentimental guts. If you don't have those, find someone who does and get him or her to help you. Because stage one of any good clean up effort involves getting rid of big crap that you don't need. 4. Be sentimental. In your own way. As a minimalist, being sentimental can be hard and along these lines, I have a huge confession. It's one that could get me in a lot of trouble (much more than falling asleep while tutoring), but in the name of organization, I will come clean (pun intended). Over the course of my life, I have accumulated lots of sentimental items that I want but I don't want to keep. People with more hoarding-like tendencies won't understand my compulsion to have less stuff, but let me assure you, it's a very real thing. Too much stuff makes me anxious. The only way to quell that anxiety is to bring that stuff to a happier home and keep my home less cluttered. Years ago, I learned that at the same time that I wanted to minimize, it made me sad to rid of things that meant something to me. Then I invented a solution. Anyways, I doubt that most people are as nutty as me to photograph and donate sentimental things, and I really only use it as an example of how everyone needs to find their own balance of sentimental storage. And feel free to offer up your own great organizational tips in the comments below. There must be other neat freaks out there. Anyone? Anyone? I will never forget when you helped me organize my room when you visited for Rachel's 25th birthday. Every time I asked "can I keep this?" You would smile and shake your head no...hahaha I got rid of quite a few things.that day. And I always think of you saying your poem about having a place for everything so everything can be in its place. The refrigerator...it is amazing how good you can feel with a clean fridge. I go as far as color coordinating my gatorades. That is ridiculous. However, organizing the fridge is not! If you can track how much you throw away and don't use, you can save a decent amount of money by managing how much you really need to buy (I made a spreadsheet for it). Digital...Now that EVERYTHING is digital, you can save old documents, letters, pictures, files in the digital form. Always back them up so you don't lose them (either on an extra hard drive or "cloud" space (Amazon)). But you can save a lot of space! Just scan and save...booyah. Clothes...People often ask at work why I wear the same shirt all the time. That is because I only own about 5. How many shirts do you really need? Most of my clothes are actually hand me downs from John Merchant. He gives them to me before he goes to good will. With less clothes, my closests are full of more fun things, like hockey sticks, basketballs, skis, etc. You should check out Patagonia's "Common Threads Initiative" if you get a chance...a company that I have grown to respect more and more. Hope all is well Tara! Happy New Year!!! Awesome tips Michael Bower! Obviously I understand color-coding in the fridge. I only wish Teddy did. Which reminds me, a friend of ours keeps her books in color order (she's an artist) and it looks awesome! I love that you are John's Good Will drop off point. Does he give you the old kid toys too? :) Thanks for the comment!! !